Arleta Lefler (60) talks to her supervisor, Theresa Gleason (52), about how faith informs her work as a nurse. 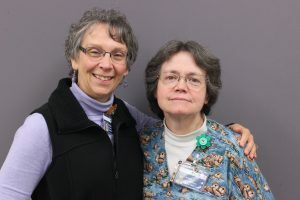 For Arleta, nursing is a “God calling.” She recalls memorable moments of interacting with patients from throughout her career. Arleta: “I knew at five years old that I would be nurse, and I never changed my mind. So I feel like my nursing actually was a God Calling. And in fact I guess I’ve put my own little life label on it, and I call it More Than a Job, and as I’ve gone through this “job” during my life so many things have happened that has reaffirmed to me that it’s more than a job. That my nursing is actually a ministry, it’s meeting people’s needs.